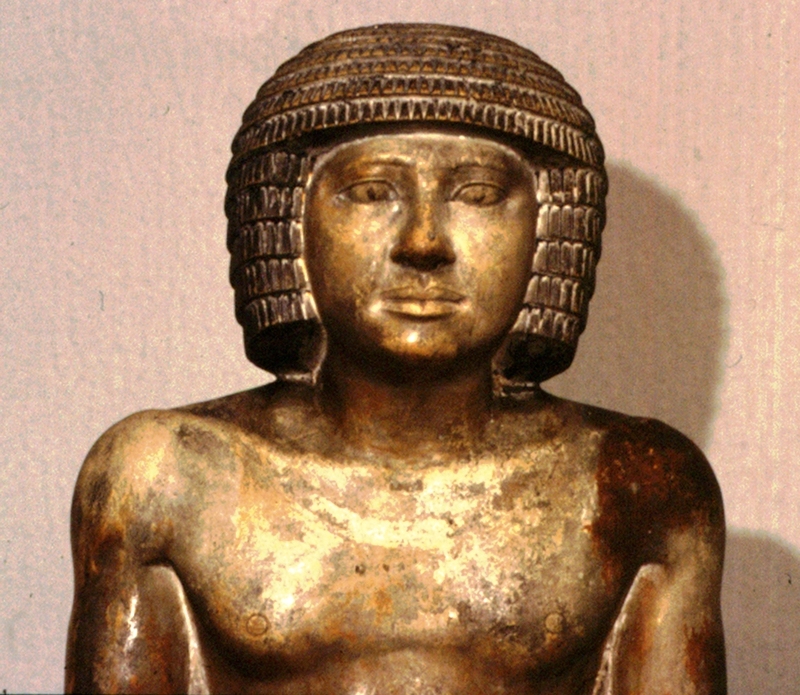 Sekhemka was a man of some importance. He was a scribe and the representation of scribes became common in the Fifth Dynasty as the number of literate administrators increased to serve the royal temples and estates. He is named in an inscription on the plinth of his statue as “Inspector of Scribes in the House of Largesse, one revered before the Great God”. 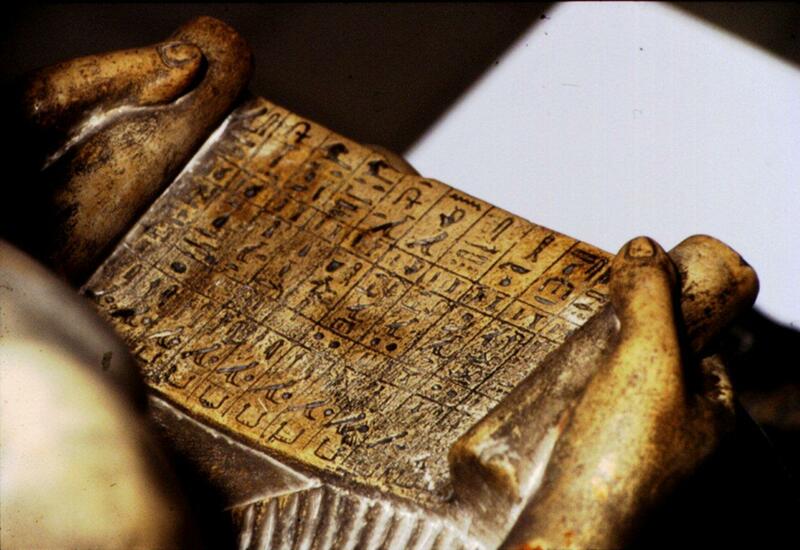 In ancient Egypt a scribe was a man of high status, well educated and someone who had access to all high offices. Few people in ancient Egypt were literate and Sekhemka was an administrator at the highest level, possibly even in the Royal Court. He lived in the Old Kingdom (2700BC-2250BC) at the period of Egyptian history when the pyramids of Giza were built. This was a high point of the ancient Egyptian civilisation. At first, tomb statues were reserved for the royal family. As the economy of ancient Egypt prospered many more private individuals who served as administrators, like Sekhemka, could command the services of craftsmen to work on their tombs and supply statues. During the nineteenth century the search for antiquities in Egypt gained pace. The necropolis or burial city at Saqqara near Cairo is the site of many tombs and one of these is believed to have belong to Sekhemka. What was the purpose of the statue? The statue of Sekhemka is worked from limestone, mined from the quarries at Tura in Lower Egypt. Immense quantities of limestone were used to build the pyramids at Giza and the necropolis at Saqqaara. The statue itself had two purposes – to ensure the physical appearance of the dead person and to ensure, by naming them, the offerings to be made for his survival in the afterlife. Sekhemka is show holding a roll of papyrus on which are listed these offerings. These include bread, beer, wine,perfume, cedar oil and linen clothing. Offering bearers are depicted on three sides of the statue and they bring papyrus flowers, rolls of linen, incense, ritual liquids, geese and calves. The face of Sekhemka is calm and expressionless. He eyes are carefully moulded with the pupils marked in black. The rims of the eyes and the eyebrows are raised, not carved in relief. The nose is broad and short. The lips are full and sensual. At his feet is a woman on a much smaller scale. The woman is thought to be Sit-merit, whose name means 'Beloved daughter'. She is almost certainly the wife of Sekhemka as she clasps his right leg in an affectionate pose. Her body was originally painted with a dark blue dress, little trace of which remains apart from on her chest. She wears a bracelet on her right arm and an anklet on her left leg. Sit-merit wears a full wig, as was usual for people of high status in ancient Egypt. Her own hairline is visible peeping through at the front of the wig. On the front of the plinth is the figure of a young man named as 'Seshem-Nefer' meaning 'Beautiful leader'. He is presumably the son of Sekhemka and his title is also 'Scribe in the House of Largesse'. He too was originally painted. He does not wear a wig which would indicate he is a young man or even a boy and he carries a lotus flower, symbol of youth, in his left hand. The relative smallness of the wife and son are deliberate. This emphasises the importance of Sekhemka as the owner of the tomb statue. It is increasingly a practice of the later Old Kingdom. 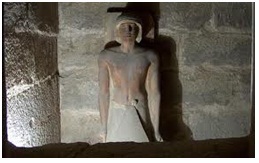 It also had the advantage of saving on time and expense if only the tomb owner was depicted. How long has the statue been in Northampton Museum ? The actual date of its arrival in the Museum is not known for sure but it was certainly on display before the end of the 1890s. In 1899 an Egyptian Room was established in the newly opened Abington Museum. This was a popular innovation and the statue remained here on public view until the 1950s. In the 1950s it was removed to the Art Gallery at Central Museum in Guildhall Road where it remained on display until two years ago. Why is Sekhemka so important ? Towards the end of the Old Kingdom the stability of the Egyptian state began to fall apart. 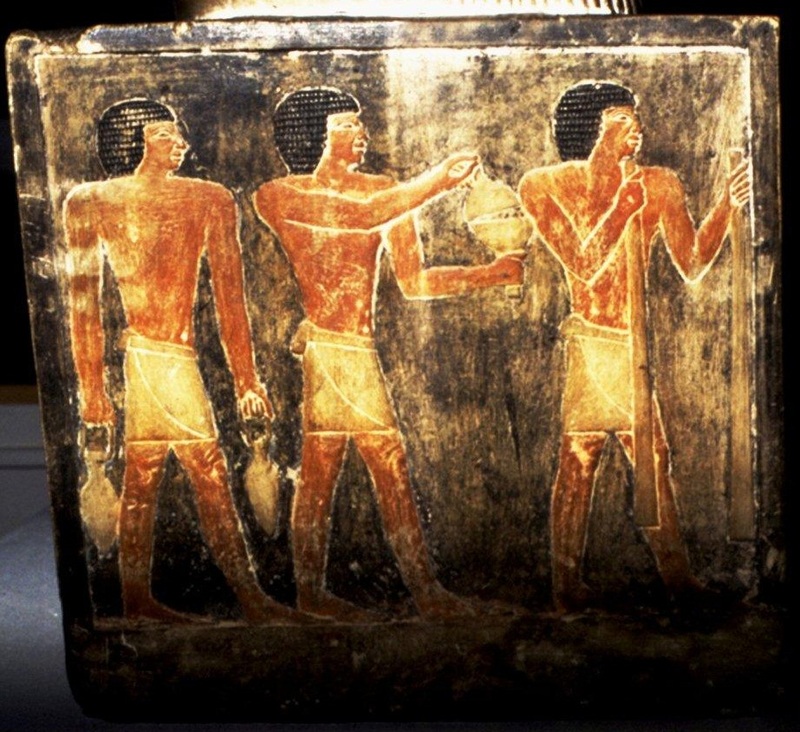 The popularisation of tomb statues which reached a high point in the Fifth Dynasty (c 2400 BC) continued but there was a degeneration in the high quality of earlier works. The mass production of these “eternity portraits” resulted in smaller pieces with a loss of individuality in the faces and the eyes are no longer inlaid. There are also positive developments such as the sculpting of scenes on the sides of the statue and the addition of the figures of wives and children.These later portraits, of which Sekhemka is one, are rarer and therefore of greater interest and value. The Old Kingdom period covers Dynasties 3-6 (c 2700-2250 BC). During this period there is widespread activity in the working of stone of all types. The statue of Sekhemka is worked from limestone. From the Third Dynasty onwards the quarries at Tura in Lower Egypt were exploited for limestone to serve the great needs of the necropolis at Saqqara. 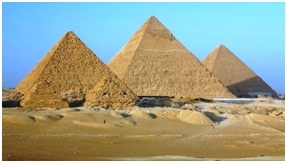 Immense quantities of limestone were used to build the pyramids at Giza. At first, tomb statues were reserved for the royal family. As the economy of ancient Egypt prospered many more private individuals who served as administrators, like Sekhemka, could command the services of craftsmen to work on their tombs and supply statues. Sekhemka was a scribe and the representation of scribes became common in the Fifth Dynasty as the number of literate administrators increased to serve the royal temples and estates. Sekhemka is shown holding a roll of papyrus on which are listed offerings intended to sustain him in the Afterlife. These include bread, beer, wine, perfume and cedar oil. Offering bearers are depicted in low relief on three sides of the plinth on which Sekhemka is seated and they bring papyrus flowers, rolls of linen, incense, ritual liquids, geese and calves. Sekhemka weras a short wig arranged in rows of tight curls. His only garment is a linen skirt, plain on one side and pleated on the other. Traces of paint around his neck show the outline of a necklace or pectoral. The face of Sekhemka is calm and expressionless. His eyes are carefully moulded with the pupils marked in black. The rims of the eyes and the eyebrows are raised, not carved in relief. The nose is broad and short. The lips are full and sensual. A woman, shown on a much smaller scale, sits at his feet. She is named as “Sit merit” (“Beloved daughter”). She is almost certainly the wife of Sekhemka as she clasps his right leg in an affectionate pose. Her body was originally painted with a dark blue dress, little trace of which remains apart from around her breasts. 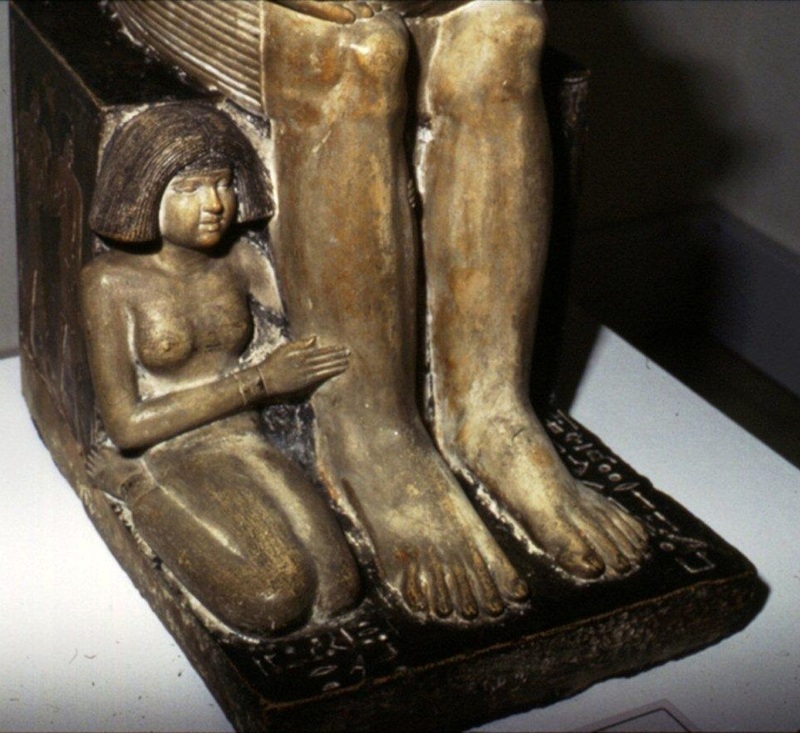 She wears a bracelet on her right arm and an anklet on her left leg, Sit-merit wears a full wig, as was usual for people of high status in ancient Egypt. Her own hairline is visible peeping through at the front of the wig. On the front of the plinth is the figure of a young man named as “Seshem-Nefer” (Beautiful leader). He is presumably the son of Sekhemka and his title is also “scribe in the house of largesse”. He too was originally painted. He does not wear a wig which would indicate he is a young man or even a boy and he carries a lotus flower, symbol of youth, in his left hand.